On to the race for governor. Term limits bar McAuliffe from seeking a second term in office. His lieutenant governor is running to succeed him. He's defending his record on the economy and his achievements - investing in education, dropping unemployment rates. Facebook, Google, Iron Mountain, Amazon all coming to Virginia. McAuliffe is recapping the bills he's blocked that he says a Republican governor would have signed into law - relating to funding for Planned Parenthood and rights for LGBTQ individuals. He argues that passage of such laws could be a turnoff for businesses considering moving here, like Amazon. Says there are no so-called sanctuary cities in Virginia - says an ad run in support of Ed Gillespie is false. On to the slave auction block in Fredericksburg and Confederate symbols? McAuliffe: State law gives cities the right to decide the fate of statues, but not towns or counties. Localities have the right to rename roads. McAuliffe: Permits are antiquated, need to be updated so that they are commonsense, for protests at the Robert E. Lee statue in Richmond. On to day care regulations. New regulation would require workers to speak English. McAuliffe: He's not seen the concerns from the Fairfax Co. Board of Supervisors. The state is leaning in on day care providers in the wake of several tragedies. On to a second Potomac River Crossing. McAuliffe is encouraged to see Maryland considering public-private-partnerships to improve its interstate network. But he's concerned about the American Legion Bridge. He says he's willing to work with Maryland to improve the bridge. McAuliffe wants to see the tolled Express Lanes travel the entire Beltway. We will step up to the plate to partner with them. He'd put money into a study for a new bridge. We are all in. 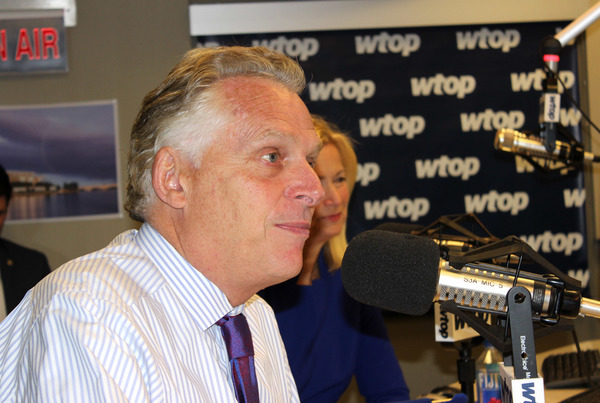 McAuliffe: New study shows state to grow to 10 million people. What are we going to do with a 1.5 million more people with existing infrastructure. Big concern, especially in Northern Virginia. That's it for this month. Thanks for all of your questions and for joining us. We'll put the audio and a story shortly. Governor, you talk about real transportation solutions. Northern Virginians want a second Potomac crossing north to ALB, why would you not extend your hand to pitch in money to build the bridge with Maryland (and mostly the money can be recouped with Tolls) if you really want to solve the NOVA traffic problems. Is it all talk but no action? Are you planning on giving any more pardons before your term finishes? When it comes to the safety of the citizens of Virginia, there are bumper to bumper traffic issues that are taking years to think about resolving the situation. Why does it take so long to ensure the safety of Virginia Citizens? When it comes to Cyber Security, why are cities not held accountable?